A Neighborhood Watch program is a group of people living in the same area who want to make their neighborhood safer by working together and, in conjunction with local law enforcement, to reduce crime and improve their quality of life. Neighborhood Watch groups have regular meetings to discuss what is going on in their neighborhoods, how it effects the residents, and what can be done about any concerns or problems. The goal of Neighborhood Watch is to provide residents with a greater sense of security, responsibility and personal control. Contact Officer Keenan Riordan at 513-346-5530 or kriordan@springdale.org for more information. The program will provide information to the citizens who attend, so they may make informed judgments about the Springdale Police Department, other Law Enforcement Agencies, and police activity. Understanding can dispel suspicions and misconceptions, and increase police/community rapport through this educational process. The Police Department, in turn, becomes more aware of the feelings and concerns of the community through input from the students. This will help to establish open lines of communication and cooperation in our shared goal of achieving the best police service for the citizens of Springdale. It is our hope that the CPA graduates will become partners with us in identifying problems and solutions to the crime issues that are affecting our community. Contact Officer Keenan Riordan at 513-346-5530 or kriordan@springdale.org for more information. Safety Town teaches 4 – 6 year olds the basic fundamentals of bus, street and bicycle safety over a 5-day course. 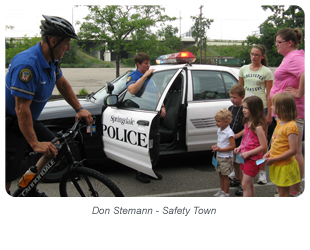 Safety Town is presented by the Springdale Police Department in cooperation with the Springdale Fire Department and Girl Scouts of Western Ohio. Safety Town has been running for over fifty years! The course occurs over the summer and dates will be posted once a schedule for 2015 is developed. The Springdale Police Department, and Law Enforcement nationwide, have had a long association with the Special Olympics Program. For more information click on the below link.